I am a flawed human seeking redemption in Christ. By belonging to the Faith community, I have grown to love myself more as a creation of Christ and am able to better love others. I am encouraged to be bold in my faith as I see so many faithful examples around me. The support of the Faith community empowers me to strive to be the best me, and I believe more and more that this community is a gift from God in my walk with Christ. I feel blessed to have the spiritual leadership I have at Faith — caring, loving leaders who inspire me through their own journeys. I especially appreciate the transparent way they work through problems, issues, joy, and grief to give me hope and inspiration. I have spent my professional career helping other people and organizations be more successful through consulting, leadership, and teaching. Success in this work has usually been measured through improved performance. Having the opportunity to apply my skills and passion to helping people and organizations in my faith life is a true blessing. Now, I can measure “success” in terms of significance, growth, and relationships in Christ. Very powerful! With the Holy Spirit working through me, my service doesn’t feel like work. I work with the Kingdom Dreams team to support the spiritual growth of adults in Christ. Part of that growth involves discovering what God has called us to be. I’m excited and honored to help others come to know how they are uniquely designed by God to do wonderful and meaningful work in God’s kingdom on earth. I am blessed to support these individuals’ growing relationships with Christ and to help manifest of their relationship through their calling. I also am called to serve the poor. 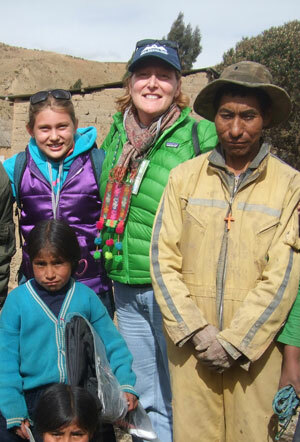 My family and I sponsor several children in Bolivia through Food for the Hungry, and we have travelled there to meet and serve the children’s communities. I am especially moved to show my own children how they are connected to other children on earth, and that Jesus wants us to take care of those who need us. Continue to support my spiritual journey and live in community with me. Hold me accountable for spiritual practices and engage with me in a creative exploration of how to better bring about God’s kingdom on Earth. I will continue to walk with people in exploring their Kingdom Dreams and will work to enhance Faith’s relationships with Food for the Hungry. I will pray for those in need and provide encouragement whenever possible.